Our first show of the year is on 12/5/18… click HERE for details. A collection of our greatest hats is now streaming and it’s also a FREE download… 13 songs! Dig in on it HERE. Check out this interview we did with The Noise. We visited 95.5 WBRU and recorded a few songs in their studio… Check it out. Limited to 25 copies. 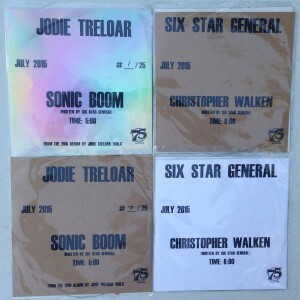 These singles consist of clear poly-plastic with holographic, kraft, white, or clear numbered jackets. The four options are shown in the photo above. All styles while supplies last. There is no digital download for this release. However, both songs are available on albums. This is not vinyl. If you are interested in learning more about lathe cut singles, go to funky frankenstein for more info.